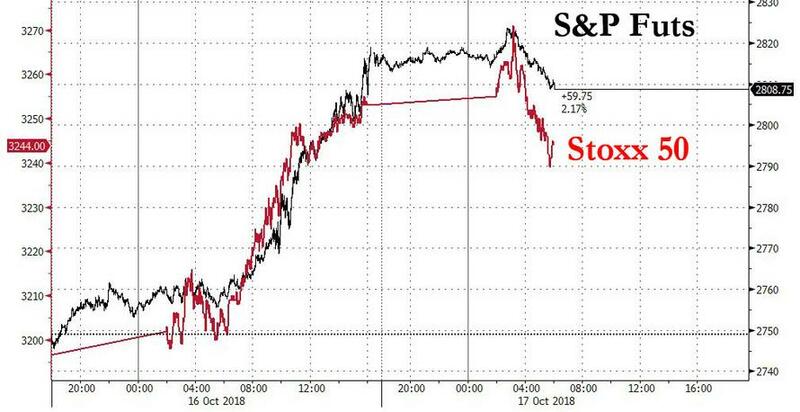 S&P 500 futures fell to session lows, down 0.3% following yesterday's torrid rally, while Nasdaq 100 futures also turned red despite Netflix' 12% surge. The global rally fizzled as European shares pared earlier gains and turned flat in morning trade, after the Stoxx Europe 600 gained 1.6% on Tuesday. The dollar rebounded, trading at session highs and Treasuries were unchanged at 3.17%. Europe was dragged lower by auto stocks after data showed car sales in the region plunged in September and Goldman warned 3Q was a “challenging” quarter for industry, with potential for downward earnings revisions by suppliers. The drop outweighed a gain for technology companies in the wake of solid results from chip maker ASML Holding NV. Europe's slide reversed an upbeat mood earlier in Asia where MSCI’s ex-Japan share index added 0.6% while Japan’s Nikkei jumped 1.3%; South Korean and Australian shares also posted strong gains, while even the Shanghai Composite rose 0.6% after dipping in early trading. The gains followed a scintillating New York session where the three major indexes saw their biggest one-day percentage gains since March, rising more than 2% each. In the currency market, the pound dropped after U.K. inflation slowed more than expected, while the euro edged down as consumer price numbers came in as expected. 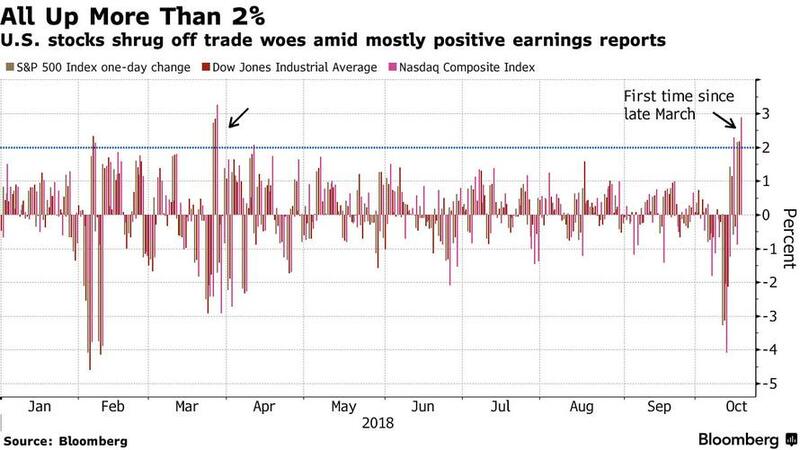 While investors are skeptical the recent volatility is over, they also hope another strong quarter of corporate profits will calm nerves jangled by trade tensions and rising bond yields. Third-quarter earnings for S&P 500 companies are seen growing 22% according to consensus. "There are negative risks in the short term, but on the positive side we have good earnings and data from the United States,” said Christoph Barraud, an economist at Paris-based brokerage Market Securities. “Last week’s correction was extreme, a lot of people became short (the market) so this is a bit of normalization." Banking giants Goldman Sachs and Morgan Stanley also posted better-than-expected quarterly profits. And on the data front, U.S. industrial production rose for a fourth straight month in September, soothing fears the economy may be running out of steam. As a result, Barraud said the out-performance of U.S. equities was likely to continue: “People want to put money where there is best visibility ... In the U.S., you have growth visibility, strong earnings (as well as) buybacks and dividends ... So the U.S. is still attractive compared to peers." The upbeat mood also favored EM currencies and took some steam out of the safe-haven yen. Turkey’s lira traded just off 2 1/2-month highs, having rallied 10% over the past week as the release of an imprisoned U.S. pastor fueled hopes of a rapprochement with Washington. Ankara said investors had put in $6 billion in bids for $2 billion of bonds it sold on Tuesday, though it had to pay a substantial new-issue premium. Sterling was the worst performing G-10 currency as UK Sept. headline CPI printed lower than expected. Brexit discussions remain in focus, with PM May set to meet Tusk, Juncker and Varadkar before this evening’s summit. “While such name calling shouldn’t mean anything in terms of what the Fed actually does, it is a factor which somewhat undermines sentiment toward the dollar,” Ray Attrill, head of currency strategy at National Australia Bank, said. In rates, French bonds pulled EGBs higher, with BTPs continuing to benefit from improving sentiment and lack of headlines following the Italian draft budget being submitted to the European Union. Germany 30y sale technically covered, though demand slips compared with prior; bonds stay higher. Core bonds pushed higher from the open, with France leading gains and German 10y yields dipping further below 0.5%. BTPs rallied for a third day, led by the front end, following Monday’s budget submission; still, the news flow is likely to be negatively skewed in the coming weeks with the European Commission expected to provide its initial response to proposals within a week, and ratings reviews from Moody’s and S&P due before the end of the month. Elsewhere, oil traded in the red and in close proximity to recent lows with WTI approaching USD 71.50/bbl to the downside while Brent edges further below USD 82.00/bbl following a surprise draw on yesterday’s API crude data. OPEC Secretary General Barkindo emerged stating that OPEC+ have decided to sustain market balance and are cautiously optimistic the oil market will remain well supplied, while Saudi are to ensure there is no shortage in the oil market. Traders will be eying the weekly DoE crude inventory data release along with any developments surrounding journalist Khashogghi who went missing at the Saudi Consulate in Istanbul. Elsewhere, metals are mixed with gold mirroring dollar action while copper came off lows. Minutes of the last Fed meeting are due out later Wednesday and should show it committed to further tightening. Expected data include mortgage applications and housing starts. Abbott, U.S. Bancorp, Alcoa, Crown Castle, and Northern Trust are among companies reporting earnings. Federal Reserve meeting minutes set for release at 2 p.m. Wednesday in Washington could flesh out what factors are informing policymaker debate on the location of the neutral rate -- a highly-uncertain dividing line between easy and tight money -- and whether they should go above it. It is also likely Trump’s trade war was also discussed at September meeting. China’s holdings of U.S. Treasuries fell for a third consecutive month in August as the Asian nation struggles to prevent the yuan from weakening amid trade tensions with America. Theresa May was told the latest Brexit proposals would be thrown out by Parliament in a stark reminder of the constraints on the U.K. prime minister as she heads into a summit to try to break the deadlock. According to three people familiar with the matter, government Chief Whip Julian Smith told her top ministers that the current guarantee to avoid a policed border with Ireland doesn’t have enough votes to pass. Asia-Pac equity markets were higher across the board as the region got a tailwind from the earnings-fuelled momentum in the US, where all majors gained over 2% and the tech sector led the advances after strong earnings including Netflix which beat on EPS and subscriber additions. ASX 200 (+1.1%) gained from the open with the tech sector mimicking the outperformance of its counterpart stateside, although miners underperformed as BHP suffered from weak quarterly output figures. Elsewhere, Nikkei 225 (+1.2%) benefitted from the broad optimism and edged closer towards the 23k level, while Hang Seng was closed for holiday and Shanghai Comp. (+0.1%) was higher amid some quasi-measures including a relaxation of FX related regulations to promote trade and facilitate investment. Most major European bourses are mixed with Germany’s DAX underperforming as the index is weighed on by Fresenius Medical (-15.0%) amid a profit warning, while auto names are also pressure the benchmark following downbeat new car registrations, subsequently pushing the European auto sector lower by over a percent, with some attributing the weakness to Goldman’s downbeat view on Q3 Stoxx 600. On the flip side, the tech sector outperforms following optimistic earnings from ASML (+4.0%) which in turn lifted the likes of STMicroelectionics (+3.0%) and Infineon (+1.0%) in sympathy. Elsewhere, Fresenius SE (-11.9%) rests at near the foot of the DAX after the company cut guidance, while Crest Nicholson (-4.7%) is firmly in the red amid a profit warning. In FX, focus was on the GBP which was boosted by above average earnings yesterday, but softer than forecast UK CPI undermined Sterling in the run up to Wednesday’s EU summit on Brexit and pre-dinner speech by PM May. Cable is now down around one full point from 1.3200+ peaks as a result, while Eur/Gbp is retesting 0.8800. Note, bids are said to be waiting at 1.3100 and 1.3080 if the low so far circa 1.3130 is breached. AUD/JPY/NZD: Marginal outperformance against the Greenback, but again very confined ahead of FOMC minutes, with the Aud benefiting from a short squeeze overnight and climbing above 0.7150, but now drifting back down and perhaps wary about a hefty 1.1 bn option expiry at the 0.7125 strike. Meanwhile, the Jpy has recovered from 112.40 lows as heavy supply up to 112.50 continues to provide support and the Kiwi has retested 0.6600, but remains capped near the big figure. Oil traded in the red and in close proximity to recent lows with WTI approaching USD 71.50/bbl to the downside while Brent edges further below USD 82.00/bbl following a surprise draw on yesterday’s API crude data. OPEC Secretary General Barkindo emerged stating that OPEC+ have decided to sustain market balance and are cautiously optimistic the oil market will remain well supplied, while Saudi are to ensure there is no shortage in the oil market. Traders will be eying the weekly DoE crude inventory data release along with any developments surrounding journalist Khashogghi who went missing at the Saudi Consulate in Istanbul. Elsewhere, metals are mixed with gold mirroring dollar action while copper came off lows. Separately, mining giant BHP has reported a 8% increase in Q1 iron ore production on the back of strong Chinese demand. The big question after yesterday’s move is whether US earnings season is coming to the rescue of markets. Risk assets rallied hard yesterday, with the S&P 500 posting its best daily gains since March, rallying +2.15%. The rally was very broad, with 92.6% of S&P 500 companies gaining on the day, the third highest rate of the year. As earnings season accelerates into its busiest portion of the calendar, the reports out yesterday boosted sentiment, with positive news from the healthcare, financial, tech, and transport sectors. The DOW, NASDAQ and NYFANG performed similarly well, gaining +2.17%, +2.89% and +3.63%, respectively. The tech sector may have been boosted by bullish talk of a potential Uber IPO, with the Wall Street Journal reporting that investment banks have proposed valuing the ride-hailing firm at $120bn, far above its prior valuation of around $70bn. Tech outperformed in Europe too, with the Stoxx IT index gaining +3.30% versus the broad Stoxx 600’s +1.58% gain. The DAX and CAC gained +1.40% and +1.53%. Ten-year Bund yields rallied -1.2bps, while Treasuries and the dollar were little changed. EM equities gained +2.51% while EM FX gained +0.58%, led by gains in the Turkish Lira (more below). Several major US companies reported strong third quarter earnings yesterday, highlighted by UnitedHealthcare, Morgan Stanley, Goldman Sachs, Netflix, and the transport firm CSX. UnitedHealthcare beat consensus earnings estimates and boosted its full-year outlook, with investors relieved to hear the company talk down concerns over rising costs. Morgan Stanley and Goldman Sachs both beat consensus estimates as well, with investment banking revenues up strongly. Both saw mixed trading activity, with FICC up and equities down. Netflix gained around 12% after US markets closed last night, as it beat expectations on revenue, earnings, and – most importantly – subscribers. The railway firm CSX beat expectations as well, and in an encouraging signal for the macroeconomy, reported a robust increase in freight volumes on the quarter. Blackrock and IBM both underperformed after their earnings reports, but they were overshadowed by the slew of positive news. This morning in Asia markets are up largely tracking the strong session on Wall Street. The Nikkei (+1.50%), Shanghai Comp (+0.10%), Kospi (+1.20%) and ASX (+1.18%) are all up. Markets in Hong Kong are closed for a holiday. Elsewhere, Futures on S&P 500 (-0.06%) are largely unchanged. 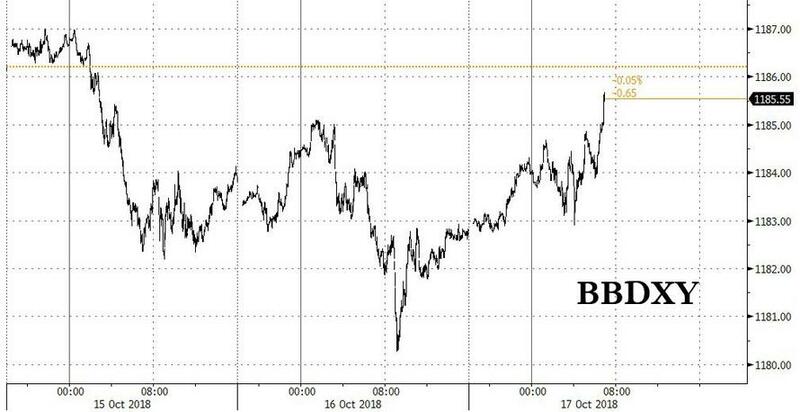 Elsewhere, our economists continue to think that Italy is squarely on a collision course with the European Commission, whose President Juncker said yesterday that there would be a “violent reaction” from other euro area countries if the Italian budget were to be approved. The Commission has two weeks to decide on whether to ask for budget revisions. Nevertheless, Italian assets gained yesterday in the first trading session since the government finalised the budget plan. The FTSE-MIB gained +2.23%, pacing gains in Europe, and 10- year BTPs rallied -9.3bps. Partially this reflected the broader risk-on sentiment yesterday, but it may also have been a reaction to a new poll showing Five Star + Northern League support at 58.6%, still a majority but at its lowest level in over six weeks. Also in European politics, Prime Minister May navigated her cabinet meeting without major controversy, while European Council President Tusk reportedly briefed national euro area leaders that a Brexit deal is not likely to be completed until December. Later in the session, FAZ reported that the EU will offer the UK the option to stay in the EU beyond December 2020 to allow more time for everything to be in place that needs to be. However, it’s not clear how that would help Mrs May with the Brexiteers in her party. The pound gained around +0.25% on the session, though it was also buoyed by strong data (more below). Mrs May goes to Brussels today for the EU leaders Brexit summit. Expect lots of headlines but little progress yet. Back to markets and Brent crude oil gained 0.97% as the diplomatic spat between Turkey, Saudi Arabia, and the US over the disappearance of the dissident journalist Khashoggi continued to fester. Senator Lindsey Graham described Mohammed bin Salman as “toxic,” but President Trump said he had a productive call with the Crown Prince, which defused tensions. Forwards on the South African Riyal retraced some of Monday’s big moves, and the Tadawul index – the country’s benchmark index – gained +0.99%. The Tadawul has outperformed most other equity indexes this year, up +6.10%. Separately, the Turkish Lira gained +2.07% for its eighth consecutive daily gain, the longest streak since 2014, as the country continues to benefit from defused tensions with the US and better sentiment. On the economic data front, the official UK unemployment rate for August printed at +4.0% as expected, matching its cyclical low. August average weekly earnings ex-bonuses rose +3.1% 3m/3m, its fastest pace since January 2009. In Germany, the ZEW survey of financial market experts showed a modest slide, with the assessment of the current situation sliding 5.9pts to 70.1 (versus expectations for 74.4) and the forward-looking expectations down to -24.6 (versus -12), tying the lowest level since 2012. In the US, September industrial production rose +0.3% mom versus expectations for a +0.2% gain. The Fed noted that Hurricane Florence likely depressed the print by 0.1pp, so the trend was even more positive. On the other hand, capacity utilisation missed expectations by 0.1pp at 78.1%, which partially balanced out the IP print. Finally, the JOLTS job data showed a new all-time high number of job openings at 7,136,000, equivalent to 115 for every 100 unemployed workers. That’s a big improvement from the recession lows of 15 openings for every 100 unemployed workers. The quits rate also stayed at its postcrisis high, which has been a good leading indicator of wages. Looking ahead to today’s data, the highlight will be the release of the latest FOMC policy meeting minutes at 19:00 BST. In Europe, we get the September EU27 new car registrations, and the euro area's August construction output and final September CPI. It’s a busy day in the UK, with September CPI, RPI, PPI input, PPI output and the August house price index all due, along with minutes of the BoE's Oct Financial Policy Committee meeting. In the US, we get September housing starts and building permits along with latest weekly MBA mortgage applications. Away from data, the EU leaders will start to discuss the next steps for Brexit in Brussels while separately, ECB Chief Economist Peter Praet will be speaking at an event in Madrid. Alcoa, Kinder Morgan, Northern Trust, and US Bancorp will report their earnings.